It's the rumour that won't die – Microsoft is working on a mini version of its Surface tablet. But how much truth is there to that rumour? And what do we know for sure? Well the honest answer is not a whole lot. Microsoft is infamous for not making what seems like the obvious decisions. For years, rumours persisted that the company was working on a handheld console. But as history shows us, a handheld Xbox console never saw the light of day. The problem with that assumption is that it is the next logical move for Microsoft to make. But is it? At the moment, it is unclear. The success of a Surface Mini is by no means guaranteed. Hell, the success of the Surface 2 is by no means guaranteed. Earlier this year Microsoft was forced to write down just under $1 billion of Surface stock that did not sell. And let's not forget that it took Apple three years before it launched the first iPad Mini. Indeed, even after it launched, there were concerns that the tablet had started to cannibalise Apple's own sales. But let's assume for one moment that it makes perfect sense for Microsoft to launch the Surface Mini. What can we realistic expect from a smaller version of Microsoft's tablet? When rumours of the Surface Mini first emerged back in June 2012, it was hinted that Microsoft may be working on a seven-inch tablet. Back then, it wasn't seen as a Surface Mini – rather it was known as the Xbox Surface. At the time, it was suggested it may be a tablet accompaniment to the Xbox One. There was even a leaked technical specification that claimed to be for a tablet called the Xbox Surface. The authenticity of the document was never established, thought multiple reports have cited sources that say they are close to the specs of a prototype device being developed by Microsoft. Indeed, in the days leading up to the announcement of the original Microsoft Surface, much of the speculation revolved around the idea it was part of the Xbox brand. So when Microsoft unveiled the first Surface, many took the rumours to be close, but still wrong. That was the last we heard of the Xbox Surface until November 2012 when The Verge cited sources at Microsoft who claimed the smaller tablet was still being worked on. According to the site, the Xbox Surface will come with a custom ARM processor and high-bandwidth RAM. As the Xbox moniker suggests, the tablet is predominately aimed at gaming. In addition, unlike its bigger brothers the Xbox Surface will not run a full version of Windows; rather it will run a custom Windows kernel similar to the original Xbox and Xbox 360. Nothing has been heard of the Xbox Surface tablet since November 2012. Indeed, nothing was heard of a smaller Surface tablet until April of this year. The Wall Street Journal published a report claiming Microsoft was working on a seven-inch tablet that would go into mass production before the end of 2013. The paper's claims were strengthened by earlier reports that Microsoft was considering amending the minimum spec of Windows 8. According to the reports, Microsoft was considering relaxing its rules to allow devices with resolutions of 1024 by 768 run the software. That figure is crucial because it is only within the last month that the first seven-inch tablets with a resolution of 1080p have begun arriving on the market. At the time, it was unclear if it was a separate tablet, or the same device as the rumoured Xbox Surface. To this date, that is the last we've heard of the Xbox Surface tablet. However, even with the Xbox connection seemingly lost, new rumours have surfaced that suggest the Surface mini will feature built-in tracking technology borrowed from the Xbox Kinect accessory. According to Chinese site WP Dang, and commented on by IBT, unnamed sources have suggested the Surface mini will use Kinect's face and hand tracking technology as part of the user interface. Microsoft hasn't confirmed this latest rumour, but gesture technology isn't completely unknown to mobile devices - Samsung has built an "Air Gesture" feature into the Samsung Galaxy S4 smartphone that lets you scroll through pages without touching the phone. There has been little information to indicate what the Surface Mini will look like. What little information we have comes from Surface creator Panos Panay. At the beginning of October, he spoke at a special Surface event at the company's Seattle store. While he did not answer any questions about the Surface Mini, he did confirm that “multiple aspect ratios and sizes” were incoming. When pushed, he said: "We have a lot of great things that we are thinking about and working on, and there are multiple aspect ratios and sizes and awesome things to come from Surface. Previous reports had pegged the Surface Mini's screen as being a 7.5-inch display with the same 4:3 ratio used by Apple in its iPads. By contrast, Microsoft's full size Surface tablets have a much wider screen ratio of 16:9. 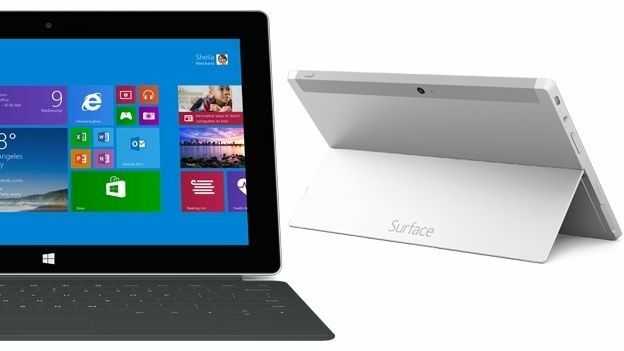 For the time being, the biggest hint about what the Surface Mini will look like is the Surface 2. The only thing we have heard specifications wise is about the Xbox Surface tablet. Those claimed Microsoft's seven-inch tablet would come with two 3.1GHz six-core IBM Power7 SCMs with 5GB of RAM and a custom AMD GPU. Even though those specs are from nearly a year ago, they still surpass anything on the market today. If they are genuine, there is no reason they might remain unchanged. We'll keep our ears to the ground. When we find anything out, we'll update this section. Price, we know nothing of. Normally we'd say it will be cheaper than the full size models, but with a spec sheet like that listed above, that may well not be the case. However, Microsoft could follow the games industry model of subsidising hardware and recovering those costs via licence fees for publishing software on the platform. As for a release date… Well, originally it was claimed that the tablet would be out before the end of this year. However, this summer saw that date pushed back to Spring 2014. At the time, it was claimed that the software development team had been pulled off the tablet in order to focus on the Xbox One. Since then, we've heard nothing. That's everything we know about Microsoft's much rumoured Surface Mini. What would you like to see in it? Let us know below, or comment on our Facebook page.